Home » BELFOR USA » BELFOR Kicks Off The 2018 Trade Show Season at RIMS and PLRB! BELFOR's professional restoration experts were LIVE on the showroom floors last week! In San Antonio, Texas the RIMS Annual Conference & Exhibition brought together risk management leaders from across the globe. 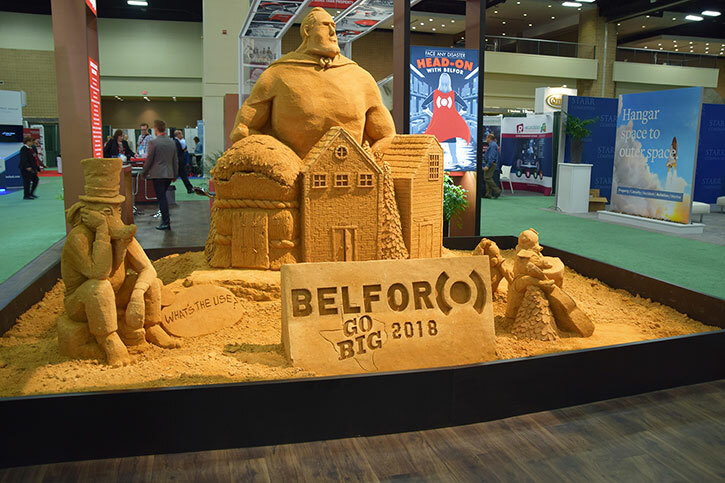 With the Expo's theme being "Go Big", BELFOR's innovative Booth in the Marketplace caught the attention of many. Once again Sanding Ovations crafted an incredible sand sculpture and a special guest, George Bell - the tallest man in the United States, joined the Team to show how we "Go Big" for our clients. Whether the property loss calls for a water damage cleanup or a fire damage restoration, BELFOR's emergency response team is always ready to answer the call! In Orlando, Florida the PLRB Claims Conference & Insurance Services Expo united a diverse range of claims professionals and over 300 of the industry's leading service providers. The Expo was an excellent opportunity for our brand leaders to discuss how BELFOR can provide clients of all backgrounds with innovative disaster response services while "Adapting to a World of Change".